Likely, you’ve been in the Pyramid Building downtown without even knowing it, especially if you frequent Three Fold Noodle & Dumpling Co.
What you may have missed is the seemingly small gallery around the corner – Gallery 221 located on 221 West 2nd Street. If you happen to enter the threshold, you’re met with paintings and works of all style. What you don’t see, however, are the other art spaces located within the maze of the building. The gallery opened in March of 2012, marking this month its fourth anniversary. Newly minted Director of Communications and Marketing, Matthew Carroll, talks about the brief history of the gallery and the family that owns it. The couple owns the Pyramid Building, which has an interesting history of its own. At 10 stories it was the state’s first skyscraper back in 1907 and was touted as the “first modern office building” in Arkansas. 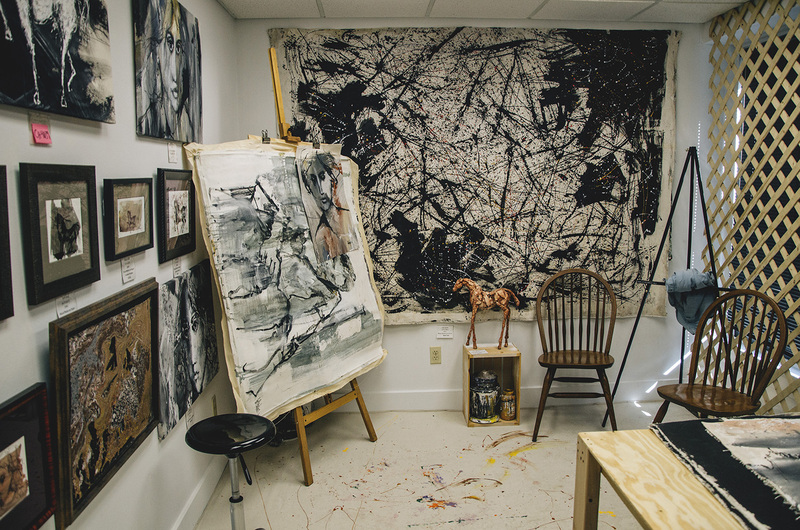 Since Carroll has taken on his new role, he has become a part of a strong team with plans to become even more a part of the local art scene than they already are. He works closely with Ms. Yates herself, as well as with Jenn Freeman, Gallery Manager. “The gallery is, I would say, the heart of the building because it’s a labor of love … Ms. Yates wanted to make sure that we are an all-in-one art space, so she made sure that we have several studios upstairs. They are true working studios,” Carroll explains. Above Gallery 221’s retail space, there are studios in which featured artists often create their pieces that they later hang to sell. There are several spaces within the upper regions of the Pyramid Building that are extensions of the bottom floor space including a Collector’s Gallery. 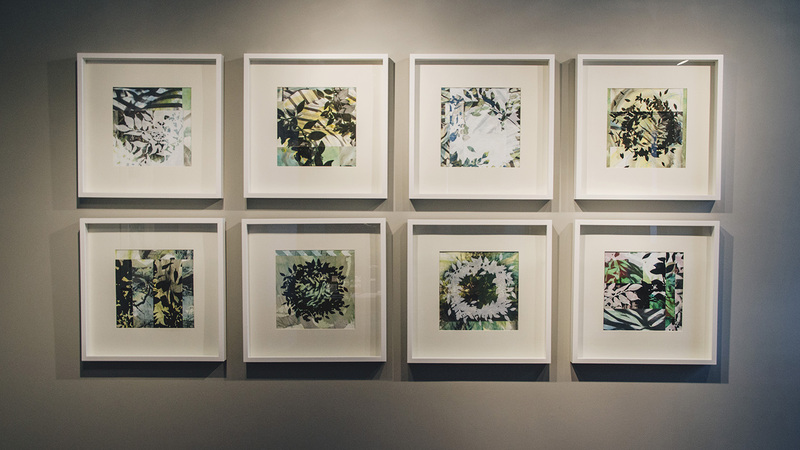 The best time to check out the whole of what 221 has to offer is during art walks or artist receptions. Don’t miss 2nd Friday Art Night at Gallery 221 this Friday, March 11, to get a chance to explore the space. If you were to head upstairs on a tour, you’re likely to see the remnants of George Chlebak’s recent “80/20” show, which took place in late February. Chlebak is a now-retired art professor from Lyon College who happened to be born on a leap-year. Although he’s 80 years old, he has only had 20 birthdays – hence the show’s name. Further through the maze of hallways, you’re transported into what feels like an entirely separate world from the hustle and bustle of the street below once you’ve entered the Collector’s Gallery. The final gallery space is known as the Gino Hollander gallery. The New Jersey native was well-known in New York in the ‘50s and ‘60s and painted alongside Andy Warhol and Jackson Pollock. His work is beautiful, and it’s amazing to be able to see the late painter’s pieces in person, which is made possible by Ms. Yates’ friendship with the Hollander family. The gallery also carries work by Tyler Arnold, Amy Edgington, EMILE, Kimberly Kwee, Greg Lahti, Sean LeCrone, Mary Ann Stafford, Cedric Watson, C.B.Williams, and artisan jewelry by Rae Ann Bayless. If you can’t make it out this Friday, mark your calendar for two upcoming exhibits at Gallery 221. First up, the gallery is presenting “The Literary Muse,” an exhibit that invites local artists to respond to, elaborate from and reinterpret literary moments from their favorite novels, plays, poems, or creations inspired by authors. Artists can submit work from March 15 – March 19. The pieces will be on display from March 26 – March 31. During that time, look for the Gallery to exhibit works by Theodor Geisel, or as he’s often known, Dr. Seuss. March will also play host to Arkansas watercolor master William McNamara, which runs alongside “The Literary Muse” and also opens March 26.